Just like the undertaking of any endeavor, the existence of the town of Oakville as we know it today, had to begin somewhere. In this case, it all started with the vision and ambition of Oakville's founder, William Chisholm. He would set out to build a town, starting with the harbour, which would grow to attract great ships. He would build a gristmill to grind grain and a sawmill to process the timber. With the basic plans laid out, this left the minor detail of acquiring the land. After the Mississauga Purchase, the British government owned the majority of the land surrounding the Great Lakes, except the land at the mouth of the Sixteen Mile Creek, which was reserved by the Mississauga Indians for hunting and fishing purposes. When this land no longer lent itself well to these purposes, the Indians sold this land too, to the Crown. 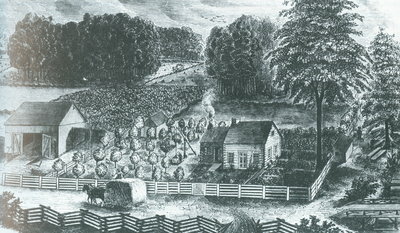 It was at this time that William Chisholm purchased 960 acres of Crown preserve at the mouth of the Sixteen, for $4116. 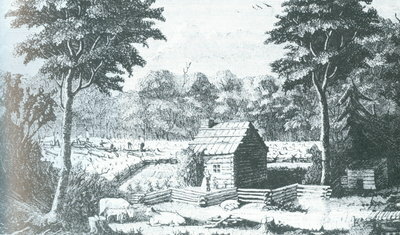 This land would come to be called Oakville, after the name given to Chisholm by the Indians, "White Oak", because of his extensive dealings with this specific timber. 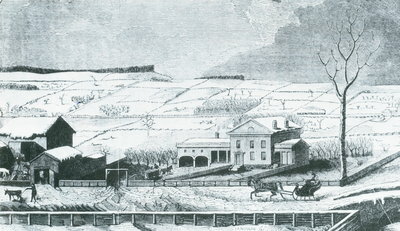 Pictured left, the images show the progression of homesteads during the early settling of Upper Canada. 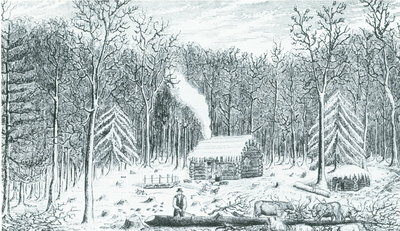 During the first stage of pioneer settlement, men felled trees by hand and built log cabins at the edge of the clearing. As time allowed, living spaces gradually became more refined. Porches were built to shelter a home's entrance, and fences clearly defined the living space. Small gardens were often seen in the yard. The next stage of development was the elaborate storey-and-a-half addition to the log cabin, equipped with glass windows. A similar progression would have been observed in Oakville during its early days. As rugged log cabins were slowly replaced by the refined elegance of Victorian style architecture, the landscapes of modern-day Oakville began to emerge. Forests were sacrificed in order to accommodate the growing population of the town, but wildlife was preserved by the lake. This ensured that Oakville residents would have the luxury and convenience of the downtown core in close proximity, as well as the tranquility that only nature can provide, only a few steps away by the water's edge. The information on this page is credited to: McKeon, Clare, and Joseph McKeon. Oakville: A place of some importance. Burlington, On: Windsor Publications (Canada) Ltd., 1986. Print.